SUMMARY: This week on Radio Ecoshock 3 interviews with scientists on the cutting edge of climate change. From the UK, Chris Boulton hunts for signs of abrupt ecological shifts. From Norway, Hans Weihe explores the changing Arctic. But first, we look into whether air pollution is shading the world from serious heating, with Bjorn Stevens of the Max Planck Institute in Germany. We know that industrial pollution in the atmosphere actually hides some of the global warming expected from our emissions. But how much? Respected scientists like James Hansen have suggested that a degree Celsius – or more – is “in the pipeline” due to the pollution, called “aerosols” in science. The Intergovernmental Panel on Climate Change has a wide range of possible impacts of aerosols, but they recently dropped their lowest estimates. The whole subject is one of the most difficult in science, because it involves swirls of widely varying materials in the atmosphere, unevenly distributed around the globe. The aerosols also interact with one of the last frontiers of science, the activity of clouds. Our guest Professor Bjorn Stevens is a director at the Max-Planck-Institute for Meteorology where he leads the Atmosphere in the Earth System Department. He is also a professor at the University of Hamburg. Dr. Stevens was previously at the University of California in Los Angeles. Although born in Germany, he is an American, educated in the United States. Bjorn Stevens is one of the world authorities on clouds and climate change. He’s the lead author of a new paper on the limits of aerosol impacts on global warming – and that paper has already stirred up controversy, including among climate sceptics. The public knows little about this scientific discussion, except when it’s called “global dimming”. I’ve run a feature about it by the BBC. I was also impressed by studies of what was first called the “Asian Brown Cloud”, but later the “Atmospheric Brown Cloud”. Below you will find a link to my 2006 program on the subject, featuring the work of V. Ramanathan of the Scripps Institute. For example, simple studies of how long it takes a pan of water to evaporate showed sunlight reaching the surface of China has dropped by at least 10% over the last couple of decades. Consider the implications for agriculture. Another huge big brown cloud forms over Northern India for part of every year, blocking out sunlight. The cause is mostly soot from inefficient indoor cooking fires! Find a text summaryof the BBC “Global Dimming” documentary here. Watch the documentary here. The Radio Ecoshock special on global dimming (20 minutes, 18 MB) is available as a free .mp3 here. A transcript of Radio Ecoshock special on global dimming, (broadcast Sept 8, 2006) is here. BUT IS GLOBAL DIMMING AN IMPORTANT PROBLEM NOW? But now in 2015 we ask: is global dimming an appropriate label for the totality of human pollution that may be shading the Earth from the real carbon blanket we’ve put up there? If I understood him correctly, Bjorn Stevens says “no” because global dimming was really about local or regional conditions of pollution (say over India or China) rather than a global effect. In fact, Stevens began to argue with other scientists who claimed a large amount of warming was being masked. That argument became his new paper “Rethinking the Lower Bound on Aerosol Radiative Forcing” published in the Journal of the American Meteorological Society in June 2015. As I understand it (and this is not easy science) – Stevens compared a known period of atmospheric pollution, in the first half of the 20th century, to a more recent period, to calculate the probably effect on global warming. The general analog for the way pollution operates in the early period was sulfur, which came from burning oil, but even more from burning coal. Sulfur pollution in that period from 1910 to 1950 was pretty well known and measured. This is the big picture method of research. In other words, Stevens doesn’t try to add up all the many sources of aerosol pollution (as Dr. James Hansen and others have done) – but instead looks at totals and comparative temperatures. The data shows that aerosol pollution is not as big a factor in hiding global warming as previously thought. That’s good news – because it means there is less danger in cleaning up pollution, say in the skies above China. We don’t really have to worry that a sudden jump of temperature will occur, according to Stevens. In fact, and this is the key, Stevens tell us the worry about aerosol dimming is a problem of the past, of the 20th century. In this century, the effects of carbon dioxide to drive warming has far out-stripped the lesser masking power of pollution. It’s yesterday’s worry, he says. Climate skeptics and critics like Judith Curry have jumped on Stevens paper to say “see, there’s nothing to worry about, it’s already as bad as it’s going to get.” Stevens was forced to respond to distortion of his research by right-wing media. I think it is be a mistake to use this to discount the concern about warming “still in the pipeline” as James Hansen puts it. There are other factors which can mask or temporarily hide the true impacts of carbon pollution, like absorption by the world’s oceans. That ocean mix down is probably a time limited factor, and the heat energy absorbed WILL come back out at some point. As for “climate sensitivity” (which we talk about in the Steven interview) – we don’t yet know for sure how much climate reacts to carbon. But so far, all the surprises in sensitivity have been worse than we thought, not better. I recommend listening to this Stevens interview as one of the more serious interviews I’ve done, with one of the world’s more prominent scientists. You can listen or download this 26 minute talk with Dr. Bjorn Stevens in either CD Quality or Lo-Fi. When a scientist starts talking about “abrupt ecosystem change” – as the title of a new paper does – that really gets my attention. This time it’s the ocean, and specifically the North Pacific Ocean – which borders some of the mostly heavily populated places on Earth. The title is “Slowing down of North Pacific climate variability and its implications for abrupt ecosystem change“. From the College of Life and Environmental Sciences, at the University of Exeter in the UK, we’ve reached the lead author, Dr. Chris A. Boulton. Going back to the beginning of things, Chris Boulton and his research partner Tim Lenton partly based their investigation on a 2008 paper that flew under the radar of most people. That was published in PNAS in 2008 by Vasilis Dakos et al. The title says it all: “Slowing down as an early warning signal for abrupt climate change.” The abstract for that paper is here, and you can read the full text here. Dr. Chris Boulton, University of Exeter. Can we predict when such a critical threshhold is reached (and when it will tip)? That would be very useful for us now. Or can we only see a tipping point after it has happened? Have we already “tipped” and we don’t know it yet? These are the sorts of questions the Boulton and Lenton’s research set out to answer. They choose the climate of the North Pacific ocean – partly because long-term sea surface temperature measurements are available, and partly because the North Pacific is subject to shifts – called the Pacific Decadal Oscillation or PDO. Talking about all this in the interview covered a wide range of subjects, including the mysterious presence of “the blob” of hotter water parked off the Pacific coast of North America for the past couple of years – and how that fits into the larger ocean patterns in the Pacific Ocean generally. We care, because these ocean conditions often drive weather formations over huge areas of the continents. Wikipedia offers this definition of the PDO: “The PDO is detected as warm or cool surface waters in the Pacific Ocean, north of 20° N.” Chris Boulton gives us more details. It’s interesting to note that this state of the North Pacific, which may last a decade or more, was first named by scientist Steven R. Hare, who was studying salmon runs in 1997. The productivity of salmon runs varied with the state of the North Pacific. You can see this knowledge is relatively recent. But what if the North Pacific ocean changes were becoming less frequent, and lasted longer in each state? Could that be a slowing down that would indicate we are reaching a climate tipping point, as Vasilis Dakos wrote about? It would be a fantastic (but awful) scoop to say Boulton and Lenton discovered the smoking gun, and yes the climate is about to experience an abrupt ecosystem change. However, in this case, an exhaustive analysis failed to prove a tipping point has been triggered. Boulton hopes to explore other cases, to find some signals that would provide advance warning of an abrupt change. It’s important science in my opinion. In the meantime, the team did find that marine systems are prone to “higher amplitude, lower frequency” events. Think about this like the stock market. The market could go along fairly calmly, perhaps slowly rising or falling, but now and then it crashes. It appears natural systems, and climate change in particular, can operate the same way. That’s a scary thought for me. What if we go into another so-called “hiatus” of global warming, and relax our efforts to reduce carbon emissions – not realizing this really is “the calm before the storm”. The apparent plateau is really a warning of an imminent large system change. I doubt human societies can digest this possibility, and be prepared to act on climate change, even when the weather extremes give us a break. Think that over. I will. You can listen to/download this Radio Ecoshock 21 minute interview with Chris Boulton in CD Quality or Lo-Fi. Scientists measure disappearing Arctic sea ice from space. Our next guest travels there, to learn from the land and local culture. 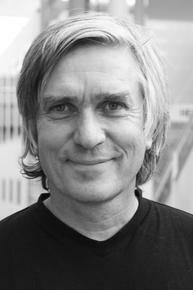 Hans Joergen Wallin Weihe is a Professor at Lillehammer University College in Norway. Dr. Weihe has travelled and researched in most parts of the Arctic, including not just his native Scandinavia, but also Greenland, northern Canada, and Siberia. He spent enough time learning from aboriginal people in Greenland that he was able to compile a a study of aboriginal languages from the Canadian north, Greenland, and Scandinavia. You can read a .pdf of the essay “Snow and Ice” in English here. Listen to or download this 10 minute chat with Hans Weihe here. That’s it for Radio Ecoshock. I appreciate you taking the time to work through this blog, and the program. I know it’s not pre-digested like so much of the media today. I find most modern media is aimed at tweaking thoughts and emotions already in our minds, rather than creating new ones. I’m also grateful for the people who Tweet and Facebook about each week’s show. To be honest, it takes everything I’ve got to find the best guests, arrange the interviews, put together the program and distribute it to various networks and radio stations. After that, I have not enough time or energy to really promote as I should. Fortunately, many listeners have taken this on, spreading the word about Radio Ecoshock shows to thousands more people all over the world. My thanks also to those folks who made donations or signed up for our $10-a-month Radio Ecoshock support team. You keep this going. Join us next week as the world turns. I’m Alex Smith, saying thank you for listening. By the way, I wrote the background music you hear in this week’s show.